There is nothing like starting the day being greeted by a happy Mexican Sunflower drenched in morning sunlight. In my wooded area I came across ten or more Cicada Hunters. They look like the world’s largest bees, but they didn’t pay any attention to me and I was able to stand among them to snap a photo. In the front yard I found a Rosy Wolf Snail shell. It was a large one and the snail probably lived a long life. There has been a new hatching of baby lizards and they are everywhere. The other night when we arrived home in the dark, we were first greeted by a juvenile toad and in the corner of the brick pillar, a Carolina Wren was tucked away for the night. I haven’t gotten a photo this year, but Pileated Woodpeckers have been announcing their arrival to the garden. Why and what did this? Some critter made a neat little path through my Balsam Impatiens bed. It is always hard to leave the the garden and after some time away, the weeds took over a bed. And now the weird and amazing. I found mushrooms growing in a bag of compost. I had planned to use it months ago, it never happened and the mushrooms grew. Plants just can’t be stopped. Yes, lizards fascinate me. I have made many posts about them and here is one more. 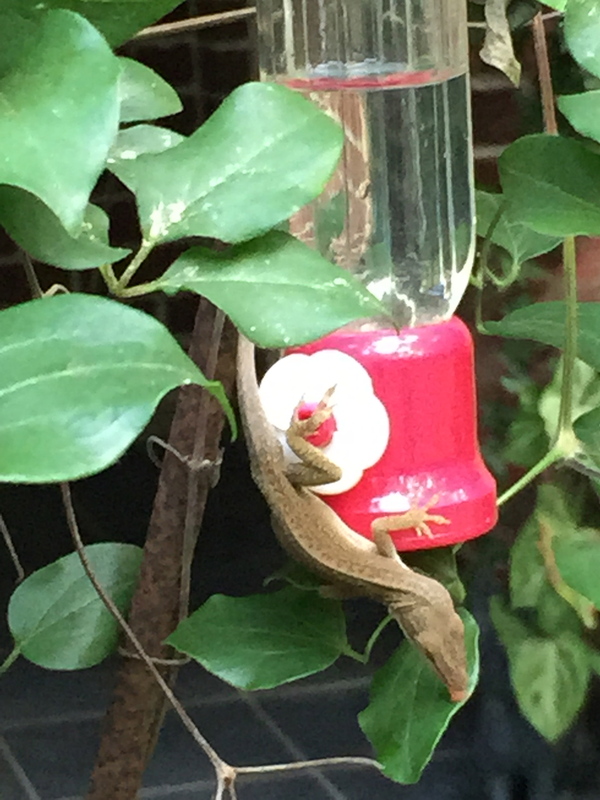 This Anole may be the same sugar loving lizard from last year. There is not exactly a line of them waiting to get a lick. There is certainly nothing cuter than a little lizard’s pink tongue. Yes, I like lizards. 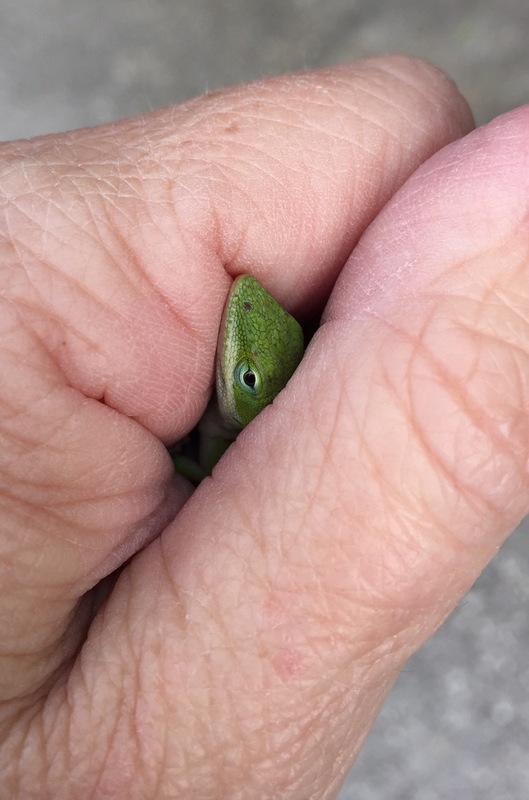 I will begin the year with one of my favorite Anole pictures, although not a very high quality shot. The poor old guy must have been really scared when I tried to help him. Take a look at Silent Scream. PS No lizards were hurt during the photo shoots. 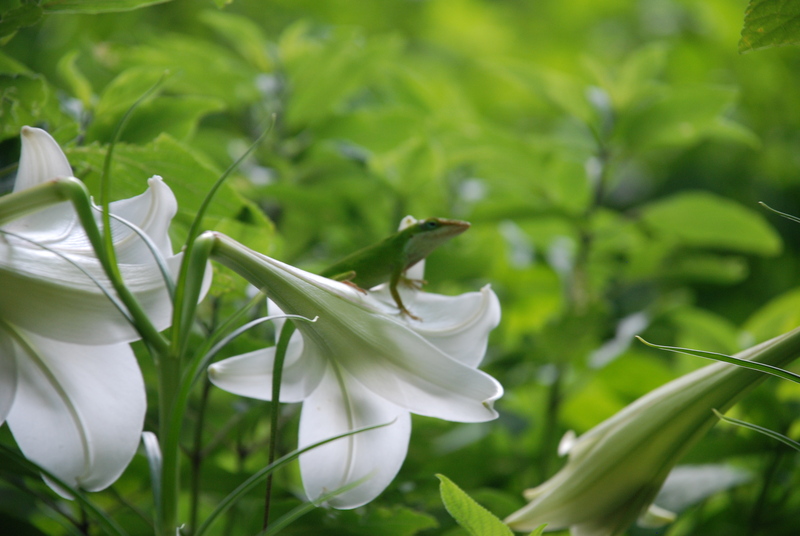 A good hunting spot was found by this Anole Lizard on top of a blooming Philippine Lily. The Anole has been hanging out there for days. 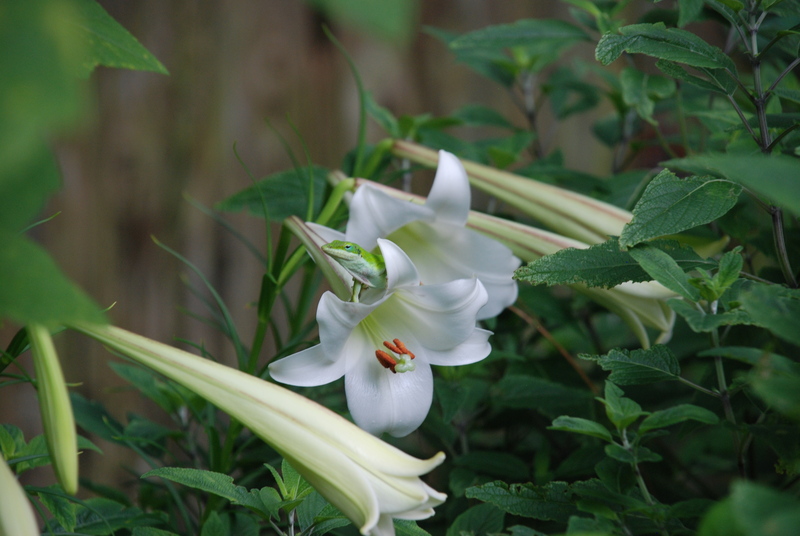 Maybe he is just enjoying the pleasant scent of the lily. Yes, I love lizards. 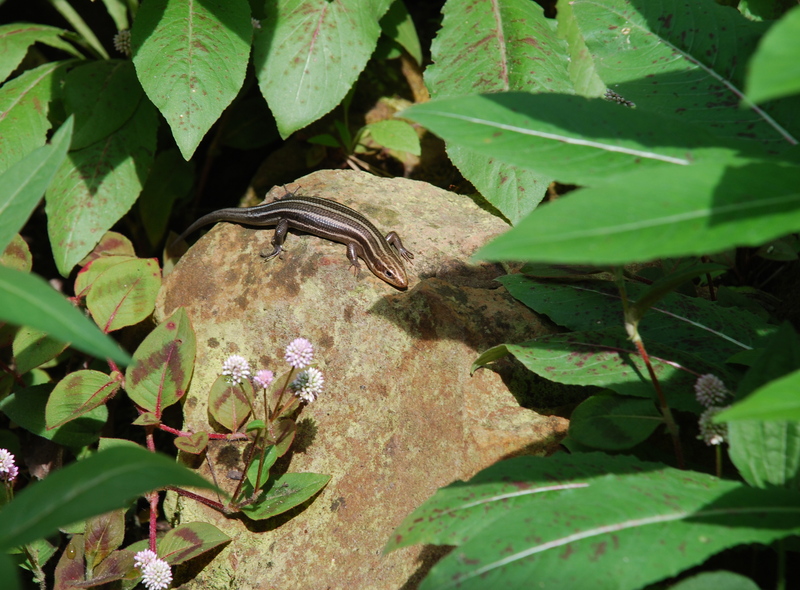 This year there seems to be a large population of lizards. They are everywhere. 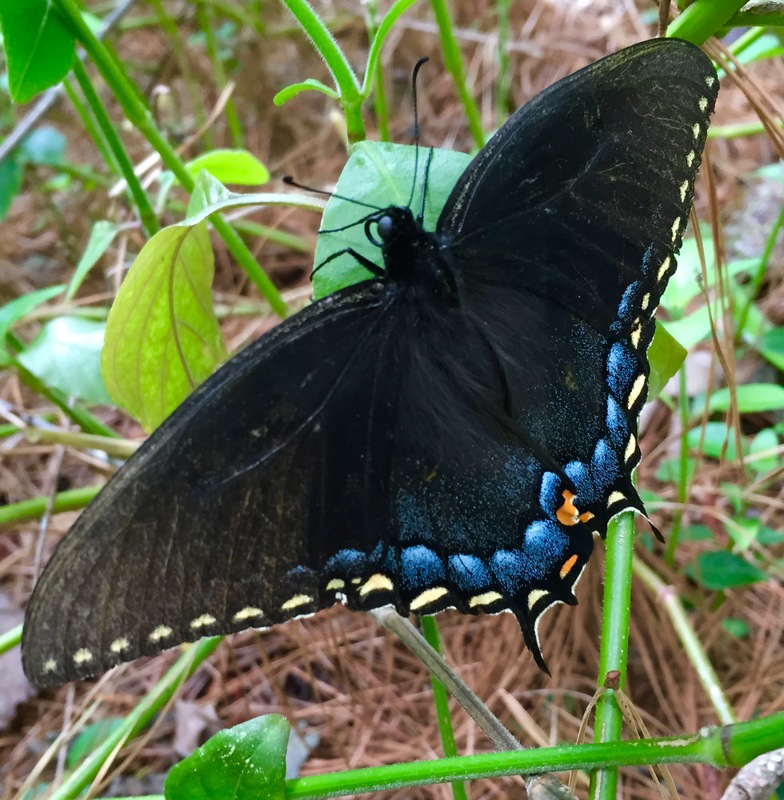 This old one was enjoying the day by relaxing on a leaf rocking in the breeze. This poor baby was in my shopping cart. I did not notice him until I unloaded all my groceries. I was able to catch him and deposited him in some bushes at the edge of the parking lot. He had his eyes closed for the trip across the lot. I had never seen this before. 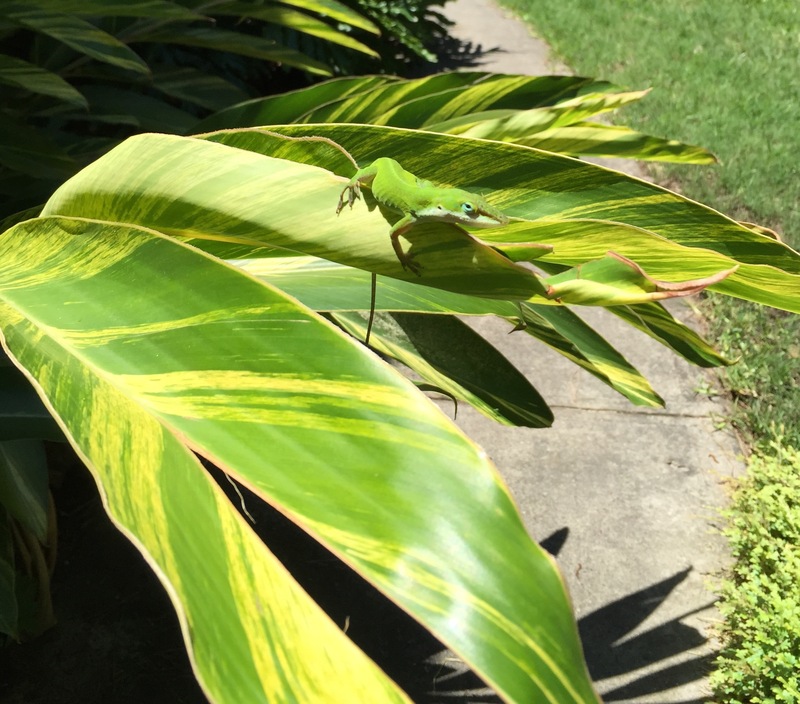 The Anole Lizard was licking the sugar that had dripped on the leaves. Notice its little pink tongue. The Hummingbirds were not happy! These are all Green Anole Lizards that can change colors.